Thanks for being cool clemence. Sorry for the off-topic about color LEDs. I can’t remember what I voted now, so I will go ahead and cancel my vote, whatever it is, and make it for the E17A/E21A choice. So, my vote might be changing, or it might be staying the same. We’ll see. Couldn’t decide myself. So I made both version: the Optisolis and E17A/E21A. The prototyping is done with better result than expected. Looks like months of various TIR optic shopping is now paid off. Optisolis is finally flashlight enabled with correct TIR optic. 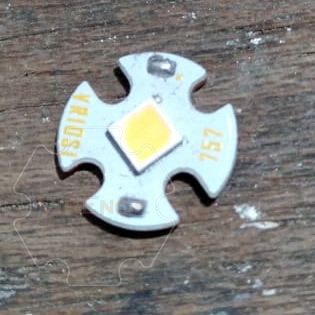 This is the pickiest LED I’ve known so far. No reflector, no plain TIR optics, even the micro lensed (peebled) TIR optics choices are limited to only few. While wide angle optics be it reflector or TIR will fix the ugly beam issue, to get usable beam angle narrower than 30° is quite a challenge. Quick test at white wall (Optisolis and 30° Microlensed TIR optic). Stay tune for more test results! Looking forward to the final options! Perfectly regulated, efficient, and best Tint and CRI, what is there not to love?? Below is the runtime test with stock plain optics except for the Optisolis which used 30° peebled TIR optic. The E21A still needs some refinement as it’s so thin and sunk 0,7mm below the optic’s holder (centering ring). This make it outputs less than it supposed. The Optisolis as expected, with it’s higher Vf has the lowest runtime. The warmer Optisolis will have longer runtime for their lower Vf. This new generation Jet-μ is very good at maintaning almost flat regulated output. Although measured less than advertised 135lm, it’s still very good at 94lm for almost an hour! E21A with it’s lower voltage gives ~2,5 more minutes. With D320 E21A (R70 unfortunately) we can get the same output. The Jetbeam bosses must be wondering how to put Mr. Wizard on their payroll ! Another run time test. This time uncooled (previously was fully submerged in a room temperature water bucket). Started in an air conditioned room at 24°C – 25°C. The light temperature only reached feverishly warm (I just made up this term… ). Higher die temperature lowers the required forward voltage. Here we can see less than 5 lumens output decrease and ~7,5 minutes longer regulated run time. I spoke to Maukka, about the possibility to make me another standard measuring lights with several CCTs using this Jet-solis. Next: Optic improvement for E17A/E21A version. I need to bring the LED 0,7mm higher to at least level with the plastic centering piece. Not just the centering peace block the light, I also suspect the photon bounced between the LED and the optic centering piece was heating the LED, reduced the output. Great work! I’m looking forward to an E21A for sure, maybe even both. I will surely take 3 different CCTs of Optisolis (6500K, 5000K and 4000K or 3500K). Again, I am too weak to resist. Hard to go wrong with Clemence. Green beacon is very eye catching from afar. Yes, a Slow Green campsite beacon in Rural Jungle seems fine. As a pedestrian, or cyclist, in the Urban Jungle, I would want Fast Red or Fast White flashes. Lovely work Clemence. I’m starting to love my Sofirn C01 and I’d definitely get this. E21A 2000K and optisolis 5000K would be my first choices for this light. For a better idea of what has been accomplished, comparisons can be made with the review UPz provided. 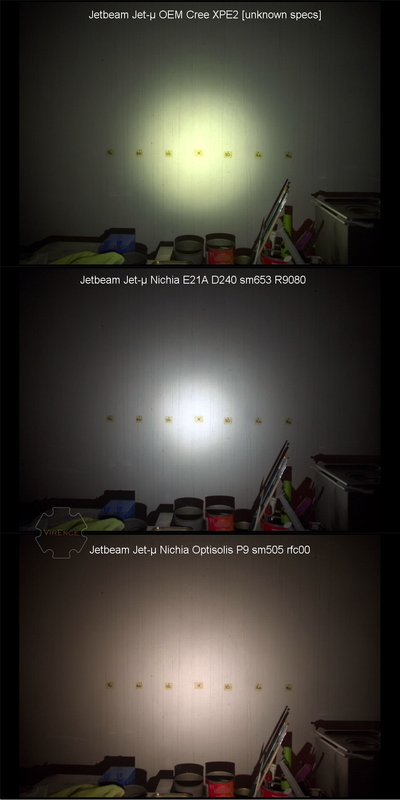 Optisolis 5K 9080 output similar to a Nichia 219B sw45 92+ Cri …but with better runtime and final slope. Truly a well executed labor of love from our Mr. Wizard ! BTW, I made some optic refinement for the JetE21A and still doing a runtime tests between packing the orders. The beam pattern is now looks almost similar to stock Cree XPE2 and the output increased to about ~10ish lm (will measure it again). The LED also runs cooler now. Will report back soon. Where did you get those nice little LED boards? No, I made them of course. But this only designed for up to 350mA. Just normal good copper MCPCB. At this power level even the stock aluminum non DTP MCPCB already more than enough. I made them with copper because I am pretty sure you guys will question me if it’s only aluminum . In my test, it’s shows no measurable difference at all (Cree XPE2 250mA current). I hope you will ‘harvest’ enough of them so i can buy a few too with my next order. Thanks Tjohn, that really puts it in perspective. The 219B used in the Eagtac judging from the Eagtacs I own, are not even 9050 because I have real 219B 9050 to compare with. I think those are just 219B 9000, which is usually much more efficient than the better color rendering, better tint versions. What Clemence is making is absolutely amazing since the 9080 or more like 9090+ Nichias will look FAARRR better and still offer about the same or better efficiency as the 219B Eagtac. ………..that really puts it in perspective. The 219B used in the Eagtac judging from the Eagtacs I own, are not even 9050 because I have real 219B 9050 to compare with. I think those are just 219B 9000, which is usually much more efficient than the better color rendering, better tint versions. What Clemence is making is absolutely amazing since the 9080 or more like 9090+ Nichias will look FAARRR better and still offer about the same or better efficiency as the 219B Eagtac. 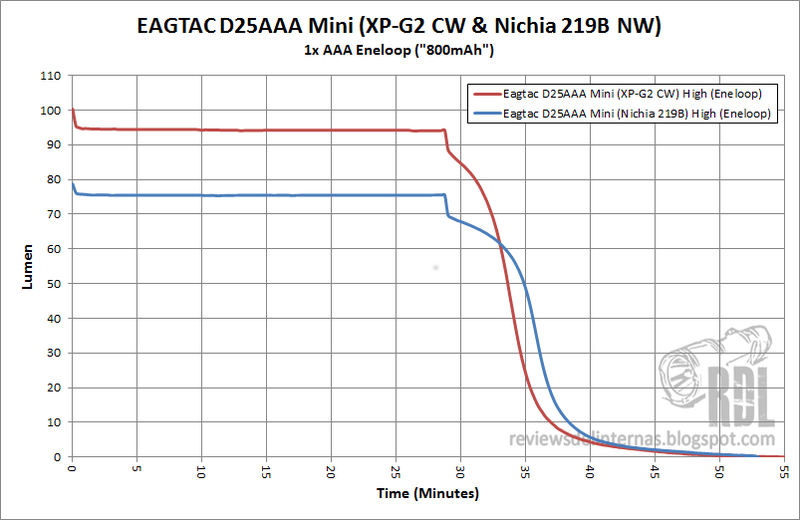 …..to further your point even more, I used to think my Eagtac MX25L3C Nichia had much better tint, until Clemence drop shipped the first Group Buy of sw45 9080 Nichia leds via Texas Ace, before his Bali store opened. Those jewels make my D25aaa and Eagtac Nichia 6 led thrower look mucous yellow-green in side-by-side comparisons. Indications are Eagtac looked for above the ANSI BBL stock for more lumen output, since according to Clemence, above or below was formerly the typical manner in which Nichia offered their sw bins. I just found this thread & happy I did. I love this little AAA light, & have one in my pocket all the time. Looking forward to this one….. Still testing the runtime for the third time. There’s something weird going on here. Can someone help me explain this? I don’t know what could cause it but I experienced something similar with a Lumintop Tool AAA. 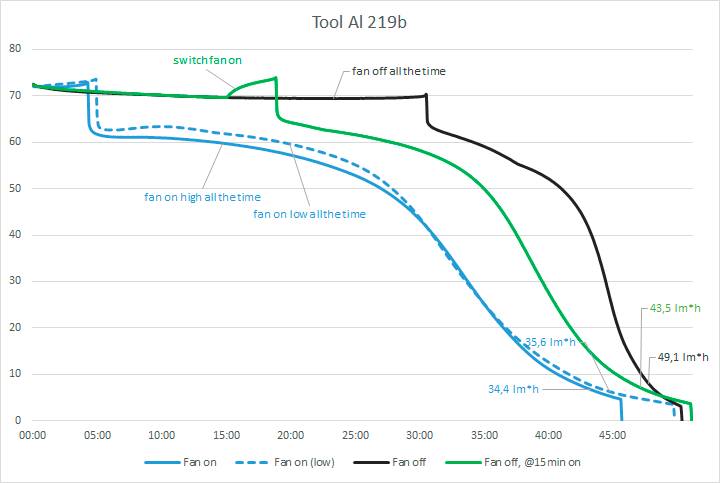 Output was higher and more consistent without cooling. Runtime was longer just like in your case. After I turned a fan on, the output dropped following a slight increase in output. Maybe it does have something to do with the Vf being higher with lower temperature. One possible cause could be the Eneloop drains more at hotter temp. The tube temperature was 40 °C. Anyway, this is an unexpected benefit in hot wheather. But expect reduced runtime in colder temperature. Did you use Eneloop in your test? Yes, it was the normal white Eneloop. Hmmm looks like better NiMh chemistry in hotter temp is the case. For the Jetsolis the voltage could be too high for the boost driver that better battery chemical reaction is not enough to boost the runtime. Maybe test it with a bench PSU. Yup, that’s what I thought too. Standardized testing of batteries is done at 20°C to 25°C, but most batteries (including NiMH and Li-Ion) actually work a bit better at higher temperatures. At temperatures of around 40°C to 45°C (or even up to 60°C) the voltage level is higher and you get slightly more capacity and a decent amount more energy out of the cell. This info is unfortunately not in the Eneloop datasheets, but I found a graph which was on the eneloop.info website back in the day. Some datasheets of Li-Ion batteries (e.g. 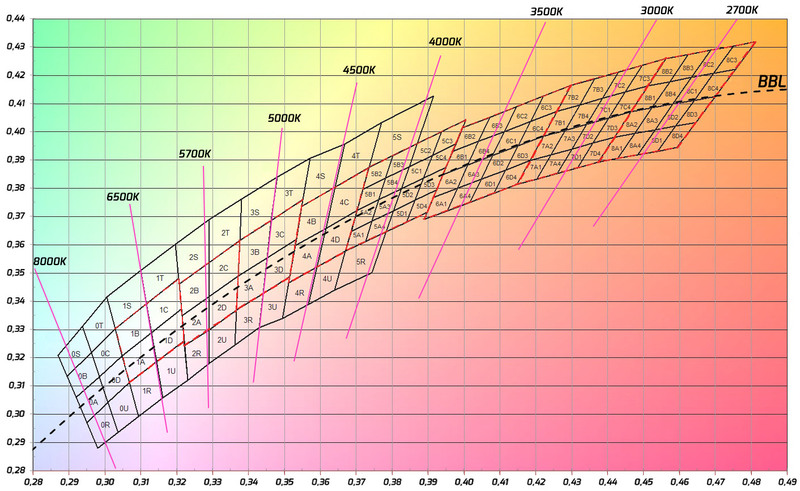 the UR14500P datasheet) have such a graph included. While higher temperatures are good for getting the maximum out of the cell, they are also detrimental to the life of the battery, but that is of course a different topic. Thanks Noir, that confirmed my suspicion. It’s good to learn new things. I will use the cooled runtime for base reference then.